Farewell 2010, thanks for the good times. 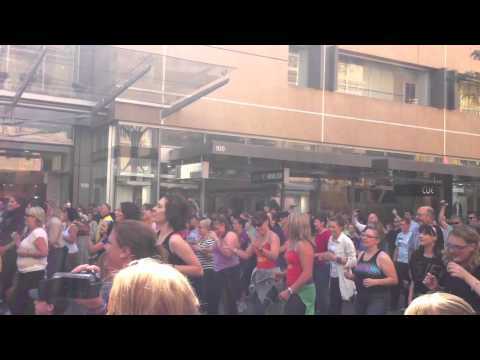 2010 – what a great year for the Adelaide Flashmob! It was a busy one this year, with a whole bunch of new events happening. We sang happy birthday to strangers, dressed up like Jackie Chan, rickrolled shoppers and launched a spontaneous musical in Rundle Mall… and that’s just for starters! The creatively named, Adelaide Flashmob #17 kicked us off for the year after a 6 month drought of flashmobs. We had a few different activities on the night, but the real highlight was ‘Happy Birthday’. We picked people out in Rundle Mall and burst into a rousing chorus of ‘Happy Birthday’ (including banners, and party whistles!) before quickly dispersing and finding our next victim friendly participant. Coincidently, one of the people we sang Happy Birthday to was Suresh from local band, The Sundance Kids. This meant that we managed to get a mention on Nova 919 the following week! When Maria Tran contacted us about taking part in her Quest For Jackie Chan, we couldn’t say no. The Adelaide Flashmob was given the opportunity to send Jackie Chan our own personal message as part of Maria’s documentary. We did it the best way we knew how, by recreating some of our classic flashmobs, dressed as Jackie Chan – masks and all! Maria’s currently in Hong Kong, continuing to work on the documentary. We look forward to the finished product! With the Hairspray flashmob cancelled, we quickly put together something fresh to take its place… and possibly one of the best, and original flashmobs yet. We staged real-life rickrolls along Rundle Mall, surprising people as thirty people suddenly found themselves on the receiving end of Rick Astley’s Never Gonna Give You Up. As always, the Burst Into Song and Dance team did an amazing job of rehearsing, teaching and performing a great musical number. This time around it was ‘Little Town’ from the Disney classic, Beauty and the Beast. Despite the weather threatening to wash us out, the Christmas shoppers were entertained by the spontaneous musical and we drew a pretty large crowd. Good times! If you want to see a video of this, head over to the Adelaide Flashmob Facebook page. Well, that’s us all done for another year (but of course, the first event for 2011 is just around the corner!). We’d like to thank everyone who has participated, brought their friends, helped out on the day and organised events. We wouldn’t be able to do this stuff without you! Hope to see you in 2011 at one of our events! Burst Into Song This Sunday! Hairspray Cancelled – New event on its way! Hear the Beat! Update for our next event!